1. Visit Settings, Accounting Defaults. Choose your check style. 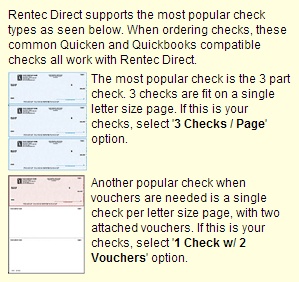 We support the most popular types of checks including 3-per-page, and 1-per-page with one or two vouchers. Click the blue question mark on this page for examples of check types. Also select here if you want to print the recipients address on the face of the checks. If you have not already setup a bank account to write checks from, do so at Settings, Manage Bank Accounts. You must have at least one bank account setup to write checks from. When setting up the bank account (Accounts Tab), a checkbox for "blank stock" can be checked if you have unprinted blank stock you are printing on, otherwise leave the "blank stock" checkbox un-checked. 2. Setting up Vendors (and Owners if you are using Rentec PM) will save you time when entering expenses. Once you setup a vendor it will be an automatic suggestion when posting expenses. If you are printing addresses on checks, that information will also automatically carry over. To setup Vendors or Owners, click Settings, and choose either Manage Vendors & Payees or Manage Owners. 3. Go to your Properties tab, and post a new expense by clicking the red dollar sign or by right clicking on the property and choosing Post Expense. You can also do this within the properties ledger by choosing the Post Expense button on the top. 4. From the Expense Type, select Print Check. Also select the Account from which this check will be drawn. Now on the Payee enter the first few letters of your payee, and if they are in your vendors or owners tables they will show within the suggestion window. Select the one you want to use, or finish typing a custom payee. If an address is configured for the payee, it will automatically populate. If you are not printing checks with addresses, the address box is of no consequence; however, if you are printing checks with addresses, be sure the address information is complete. Enter a Memo which will show on the check memo line if you wish. Now click Post Expense. 5. Click the Accounts tab (if enabled), or go to Settings, Bank Accounts. Next to the account you chose it will show something similar to [ 1 checks pending ]. Click this to enter the check printing window. Select the checks you wish to print (or check the box in the upper left to select all). Enter your next check number, and if you are using 3-per-page checks, specify how many checks are available on your first available page of checks. Click Preview Checks. 6. Almost done. Your checks are created in PDF (Portable Document Format) in order to ensure the text prints on the checks where it is supposed to. The PDF will show in the page as in the screenshot below with a preview of what the printer will print. (If nothing shows, you may need to install Adobe Reader, or if you are using Google's Chrome browser, read the special Chrome notice at the bottom of the page). Click the Printer icon (circled in red below) to send the checks to your print driver. NOTE: Each printer acts differently and may be set to collate pages; whereas some are not. After clicking the printer icon below and before clicking OK to send to the printer, you may need to choose the 'Reverse Pages' option if available to have the checks print in the correct order. That's it! Please create some sample checks and print on blank paper or disposable checks for practice before printing on actual checks. 7. Within the print dialog window,select 'Actual size'. This will ensure accurate placement of the values on your checks. When posting a recurring property expense, you can select Print Check, and as the recurring event renews it will automatically create a new check to print within the system. This is quite useful for vendors who have a fixed payment due each month (landscaping, utilities, etc). Using Google Chrome or Firefox? Google Chrome and Firefox (since Firefox 19) come with built-in PDF browsers. They have done this to improve the speed of the browser; however, in doing so they left out features critical to printing forms that require absolute placement. Fortunately, there is an easy fix for both browsers. Google Chrome Users: Visit this Adobe Blog Article (opens in new window), to read how to update Chrome to use Adobe's Acrobat Reader. Firefox Users: Visit this article to learn how to re-set back to the original Adobe Acrobat Reader. If you go to the Settings tab, then click on Accounting Defaults, you'll see a setting that indicates the types of checks that can be used.